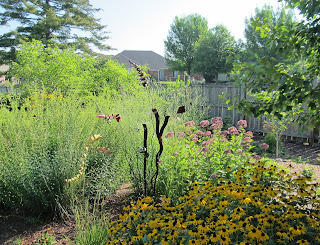 Welcome to Garden Bloggers' Bloom Day for August 2013. Here in my USDA Hardiness Zone 6a garden in central Indiana, I am astounded by the difference between this year's blooms and last year's blooms. Last year, we had no rain all summer. This year, we've had rain mostly when we've needed it and as a result, there is far more blooming now than compared to last year. I will take this year, hands down, over last year. Let's start in the flower border I call August Dreams Gardens. It is planted with prairie type plants that will mostly bloom in August or later. At one end, I planted some tall black-eyed Susan type flowers, pictured above. I am becoming quite lax of late in regards to plant labels and tags and so I no longer knew which species this is. But it is four to five feet tall. At the other end of this garden border, another variety of black-eyed susans, (Rudbeckia fulgida 'Goldsturm'? ) are in full bloom along with Joe-Pie weed, Eupatorium 'Little Joe'. What you cannot see in the picture is that Boltonia asteroides 'Snowbank' is showing its first tiny blooms and the rare goldenrod, Solidago shortii, is not far behind. Across the path from August Dreams Garden, I have a clematis climbing up and throw a bayberry shrub, making it appear that the bayberry is blooming. I do like the pure white flowers of this clematis, but sadly, I do not remember which cultivar this is. Um... one of the white ones. Across the way, a dwarf butterfly bush is blooming and attracting butterflies. This is not the 'Lo & Behold Blue Chip' butterfly bush. I have loads of them blooming in the front garden. This is a different variety that gets a little larger than those. Which variety? See above how lax I'm becoming about variety names. A volunteer Verbena bonariensis nearby is attracting bees to the garden. Bees are an affirmation of a garden's health. I'd like to thank both the bee and the butterfly for not flying away while I took their pictures. Another bloom that is attracting many pollinators to the garden is calamint, Calamintha nepeta supsp. nepeta. This plant is fairly well behaved for a member of the mint family. It grows along the edge of the border called Ploppers' Field. I like to mow right up next to it so I can smell its minty goodness when I walk by. There are other blooms in the garden in mid-August. Many of them including coneflowers, shasta daisies, the Knock-out roses, and hydrangeas are carry overs from July. Others, include the old-fashioned hosta that I call August Lilies are just beginning to bloom. All of them are a delight to me, and make me love my garden this year, especially. What's blooming in your garden in mid-August? I'd love to see and read about whatever it is that brightens your garden on the 15th of every month. I love your prairie type plants! I would like to have a prairie field in my garden too, but my tiny London garden is not exacty suited to that! Instead I have a few of these plants dotted around. Thanks for hosting the Garden Bloggers' Bloom Day again! Pretty blooms and I love how the bee and butterfly posed for your pictures! Happy GBBD and thanks again for hosting! I think the tables have been turned , you are having rain and I am just getting a wee bit. Your Rudbeckia are lovely. Looks like they might grow in my part of the world. Happy Blooms day! I do like the Rudbeckia. Yellow colored flowers suit summer! Your prairie type plants area looks gorgeous!! Love those natural taste garden:) My clematises are flowering, too. Thank you for hosting! Lovely shots of your garden, it's looking great in late summer. I think half the time I spend compiling my Bloom Day post is expended looking up the plant names I can't remeber. Maybe when I cement a few more names in my brain, I'll loosen up a little too. Thanks, as always, for hosting Bloom Day - it adds wonderful discipline to my gardening efforts. Lovely butterfly. Don't think it's one we have here in the UK, but my lepidoptery leaves a bit to be desired! 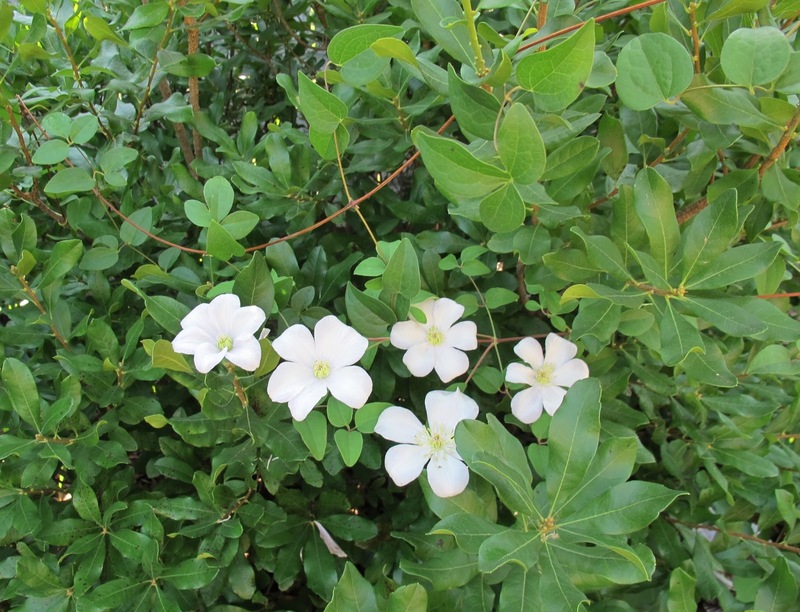 Your white clematis is beautiful - they always work so well when twined in another plant. Thank you for hosting and happy GBBD! Is that the really tall Rudbeckia - R. maxima? Thanks for hosting the GBBD again. Your August garden is really fantastic! And I love the sculpture next to the Rudebeckia. Who made it? Your August border is stunning Carol. I love the clematis growing through the bayberry too. Last year I started saving the labels with a view to creating a database. This year I have a huge heap of dirty labels on the study floor. No database. And the new challenge of matching up label to plant, should I ever get round to putting them all back..
Carol the August Dreams garden is perfect and what a delight in the August sun....and all those butterflies and bees...my butterflies have been few this year but the garden keeps blooming on. Thanks for hosting and Happy Bloom Day. Carol, August Dreams Border is well named, very dreamy and romantic. Glad to see bees, since we hear of the decrease in their numbers. Thanks for the hosting. We have been enjoying a nice summer as well, with the rain we need, not too much, not too little. I hope your good weather continues and happy Bloom Day to you. I'm so glad someone else loses their labels, some names stick but others are lost for ever! Love your butterfly, so pretty, the garden comes to life when they arrive. So glad you have had enough rain, we are suffering a bit but it rained yesterday, which has made the garden look happier. How nice of the bee and butterfly to cooperate for a photo! I've seen one or two swallowtails fluttering about, but that is all. The lack of butterflies is about the only thing negative I can say about this August; I agree, definitely much better than last year. Your August Dreams garden is looking beautiful! Your August garden border is dreamy, Carol. I'm terrible with cultivar names, too! My garden is not looking too bad for August in Texas. Happy GBBD! Glad to hear you have had ample rain this summer, May! Your garden looks lovely and has many interesting plants that I have read about but never grown. Thx for hosting GBBD! Beautiful! I have Rudbeckia, Echinacea, Moonbeam coreopsis,Butterfly bush,Cannas, and Verbena Bonariensis blooming right now. I have some volunteer Goldenrod just about ready to bloom. As always we appreicate the opportunity to have our growing world of Garden Bloggers all in one spot. Thanks you May Dreams for hosting. Loved the walk this morning. You caught a great picture of the butterfly. I finally got one by shear luck walking into a wine tasting over at Niagara on the lake... I've yet to capture one on my own butterfly bushes. Carol, I'm in agreement that this year is WAY better than last year! It's amazing how good the gardens look for August. Don't you just love the abundance of August blooms? I love this time of the year. Your gardens are looking lush and lovely. As always, thanks for hosting Bloom Day. I commend you on having such willing model bees and butterflies. Lucky one! Our weather is better this year, but . . No rain in July at all which slowed things down. Now it is cold. ish. 50's temperatures at night. Nice to have enough rain for once! And I've missed doing this for several months, so glad to be back. Your garden is so full of beautiful blooms! Isn't August grand? Thanks so much for coming up with and hosting GBBD! It's a treat to see everyone's flowers! Happy GBBD....August is beautiful but my gardens are never prettier than in the fall...I can't wait for the relief from the heat as well. Your summer garden looks lovely, Carol. Happy Bloom Day! Thank you for sponsoring GBBD! It's really fun to connect with other gardeners. Your flowers are stunning and your whimsical imagination is magical! Mr. Linky and I are not exactly friends. We had a bit of a wrestling match. In the end, I was the victor! Summer's winding down. So great to see the late bloomers! Thanks for hosting another Bloom Day. Newly hatched Butterflies are arriving daily, so those who are waiting should be rewarded soon if they're not spraying plants and picking off caterpillars, lol. Great capture of the Tiger Swallowtail. Your Blooms are terrific. Lovely photo of the August Dreams Border and the Butterfly and Bee! I love Verbena bonariensis as it is such an easy plant to grow in my area. Thank you for sharing your lovely garden with all of us! Beautiful blooms, especially the August Dreams border. I feel like my garden is 'August Dreams Gardens' too. This year certainly did turn out to be a great gardening year, weather wise! Thanks for hosting and for showing us all your lovely blooms. I have recently bought a Eupatorium 'Little Joe' so i was interested to see yours - I am hoping mine can cope with some shade. I'm giggling at Rusty Duck up there. I have buckets full of dirty labels and lots of good intentions myself! And my memory definitely isn't what it used to be, unfortunately. Who knows what the heck I'm growing out there! Anyway, yay for this year's weather...your garden looks wonderful. Hmm, I'm going to make a list of the plant names, too, maybe... if the writing on the labels doesn't fade before I start. It's great that you are having your usual summer rain. Here in the PNW we are in our summer-long dry season as usual so I have to irrigate or grow things that don't need much water, actually a lot of flowers in my photos do get almost no water all summer. You have lots of lovely things blooming in your August garden! Your garden is looking great Carol! Love those unknowns - the rudbeckia and clematis. I've become lax on plant tags lately, too, but I always blamed it on my un-organization! Good to hear you've had rain just when you needed it. Rain is usually too much or too little, nice to have it just right every now and then! Gorgeous photos! I am utterly enamoured of your border...the drift of rudbeckia is particularly stunning. I'm glad you got good weather for your garden this summer - the flowers look lovely! We had an unusually rainy July in NC so a number of my perennials are blooming late. That makes for a happy August. Bringin up the rear here ! Beautiful gardens Carol and still looking so fresh! Must be that rain! I love your tall rudbeckia! I'm still waiting for my Rudbeckia triloba to bloom this year - it's almost there. Happy Bloom Day, and thank you for hosting! I just got my post finished. I started it yesterday, but couldn't get back to it until this evening. I enjoyed seeing your blooms and critters. I clicked on the August Dreams garden to see it larger. I love your sculpture! I have had trouble keeping track of plant tags over the years, too. 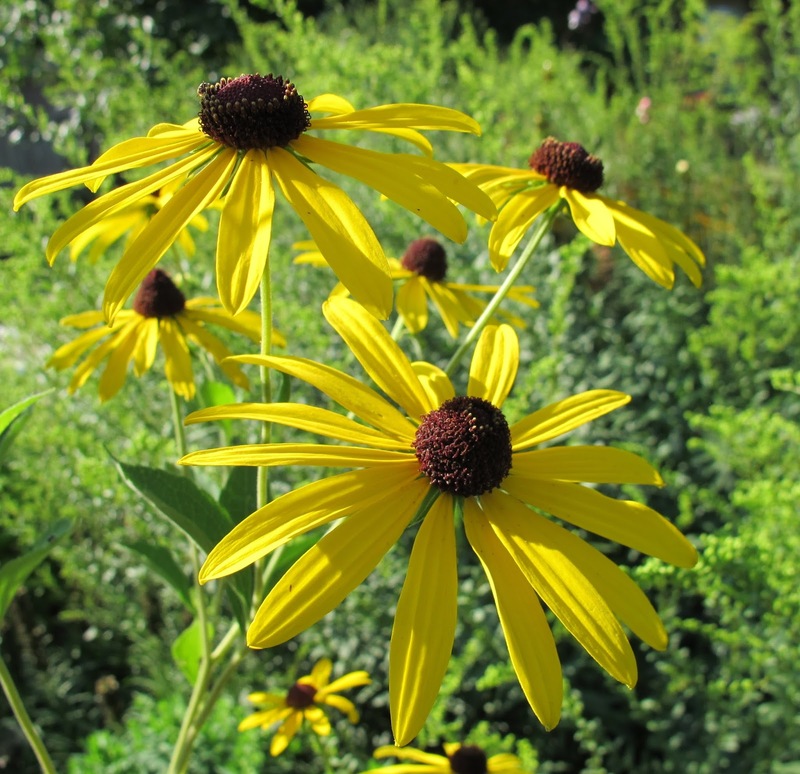 I'm wondering, though, if your Rudbeckia is Sweet Black-eyed Susan. I planted some this year, and think they sure are pretty! Happy GBBD! I'm cat-calling your garden! It looks lovely. As always, so nice to see what you're up to. Thanks for being a source of garden inspiration. Hi Carol! Thanks for hosting, as always. It's great to get some ideas for what else to plant, since I have a whole flowerbed with nothing blooming right now. I like your clematis peeking through the shrub. Those are the types of pairings I sigh over in the garden books, but have yet to implement in my garden. After a day of almost midwestern mugginess, we had a few sprinkles this evening. Not enough to really make a difference in our dry summer, but a bit of a novelty, nonetheless. Your garden looks lovely and alive with all the critters! 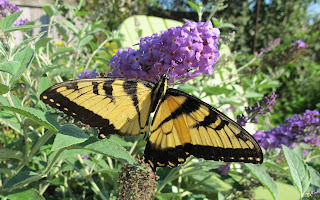 I covet your photo of the swallowtail! So beautiful! Although I'm in the midwest right now, I can't find any trees in flower locally at the moment. I'm "cheating" by posting shots I took over a week ago back home. Happy Bloom Day, and thank you for hosting! Love that prairie garden. 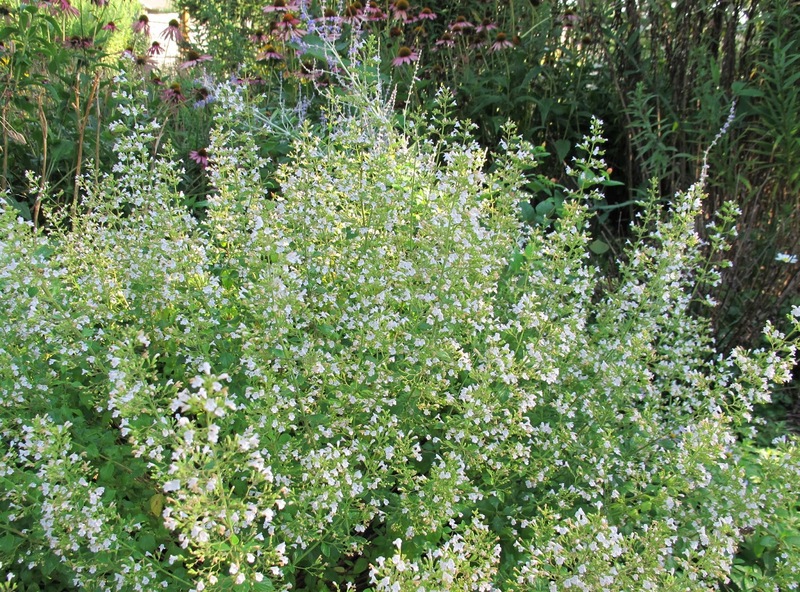 And calamint too. August is looking good. A lovely time of year for flowers, the rudbeckia are great. Fab butterfly photo too. So much going on in my small kitchen garden! I've just started harvesting summer veggies and the plants are putting out more and more flowers with promise of more produce to come. Thanks for hosting this day! I love coming here and seeing so many beautiful gardens. It inspires me for next year. Your August Dreams border is divine! Carol - Thanks so much for sharing your wonderful garden shots and insights! You've definitely thrown out the welcome mat for pollinators! I wrote about fragrance for human noses, but don't mind sharing my scented flowers with winged visitors. I'll have to look up the calamint plant. Looks so pretty and I bet would work well mixed with salvias. It's been great for us here in SOuth Caolina too for rain. The flowers this year have been beautiful. Love your gardens and all the great pictures. You might be interested in my Bluebird House Give-Away!! Beautiful blooms, Carol. Your garden certainly seems to have enjoyed all the rain. 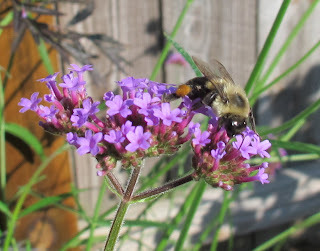 I love your pollinators, and of course your blooms! Thanks for being such an inspiration and a wonderful resource. I can't thank you enough. I adore you and your blog. Lovely post! go to my Aug. 11 post to see what's blooming in my Seattle garden.